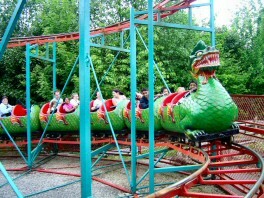 The Beastie, once known as the Dragon Rollercoaster, was first installed in 1984 in Festival Park, to allow the younger visitors to experience the thrill of a roller coaster. It has moved several times throughout its time in the park, going from Festival Park to Forbidden Valley, then moving to Adventure Land, where we feel it will probably stay for the remainder of its life. The Beastie is currently Standing But Not Operating (SBNO) and we believe it will be fully retired and removed in the not too distant future. The Beastie is a great introductory roller coaster for children, as it isn't exactly high or intense, but it is just fast enough to thrill the kids. After a short climb up the lift hill, the ride drops down and does a basic figure of eight circuit. Older guests may want to keep their arms inside the car as there are several points where outstretched hands could get clipped. The cars do 2 laps of the circuit before coming to rest in the station.